Park Flyers For Beginners and Pro's! What exactly are park flyers? Well, the name pretty much says it all. They are small electric powered RC airplanes that can be flown safely in a park, schoolyard, and other small areas where people may be present. Are you new to the hobby and your head is spinning with confusion while trying to determine what components and parts you need to buy to get your first airplane in the air? Are you wondering what batteries are best? What size and type of motor goes with what plane? What radio and receiver should you buy? All that is taken care of for you when purchasing an RTF or BNF type airplane. These come ready to fly (RTF) right out of the box and even include a charger for charging the battery. These airplane are very affordable and require little to no additional equipment to operate. Park flying type airplanes have completely changed the hobby by giving beginners a much more affordable and safer option for learning to fly as opposed to conventional glow powered trainers. The Hobby Zone Super Cub has long be the "go-to" entry level park style plane for beginner pilots. It's a stable, durable, easy to fly airplane that looks like a genuine Super Cub. is a classic high wing foamie is perfect for learning to fly. Pusher props are much less prone to damage during rough landings than convention propellers. The E-Flite Apprentice S is bit more pricey, but in my opinion worth every penny. The built-in SAFE system is pretty much a built in instructor that will take off, land, and even take over and prevent a crash by flipping the panic button! Don't think for a second that these small electric powered RC airplanes are only for beginners. The power and performance of today's high-end foamies gives traditional balsa constructed planes a run for their money! 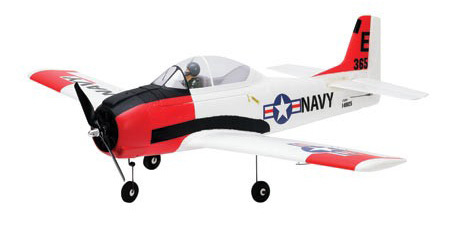 The ParkZone T-28 is a very powerful foam rendition of the popular warbird. With the help of an experienced flyer, it can make an excellent first airplane. However, it's best in the hands of someone who has some prior flying experience. 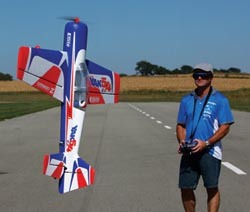 The Carbon-Z Yak 54 is one of the best flying RC airplanes on the market in my opinion. It's also very easily repairable, I've glued mine back together more times than I can count! The Habu 2 can reach speeds pushing 100 mph with the stock set up. By increasing battery and motor size, it's been recorded at speeds nearly 180mph! Watching the optional flaps and retractable landing gear in action makes it hard to believe this is actually a foamy! 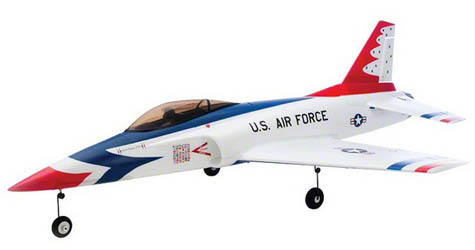 Follow the links below for even more examples of these types of model airplanes.